From 2000 to 2008, the USDMNT (number of Mongolian Tugriks for each US Dollar) was relatively stable. 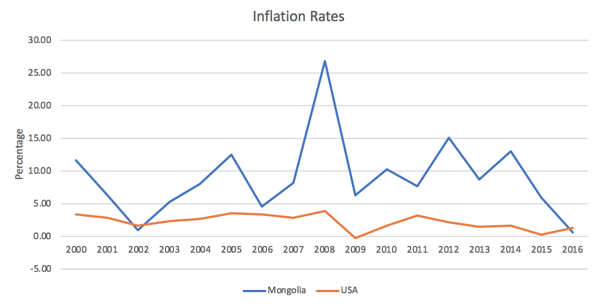 The Tugrik was decreasing slightly throughout the period, because the inflation rate in Mongolia was typically much higher than in the US, with the exception of 2002. Throughout this period, each Mongolian Tugrik was losing more of its value than each US Dollar. Thus, each US Dollar could be exchanged for increasingly more Mongolian Tugriks. The first big jump in the exchange rate came after 2008. This was likely due to the Global Financial Crisis. During the crisis, investors likely pulled money out of riskier investments to protect themselves. 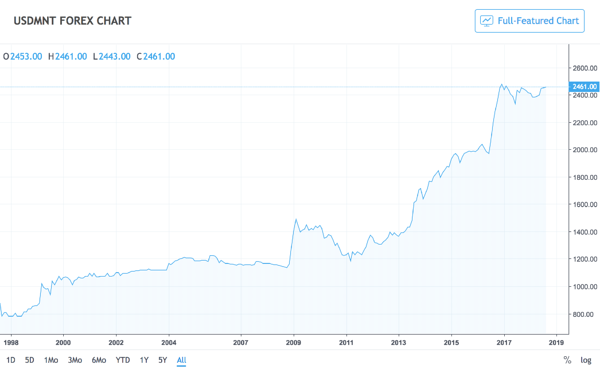 Since emerging markets are typically higher-risk higher-return investments, investors in Mongolian assets would have sold their assets and used the Tugriks to buy US Dollars or another safer asset. This decreases the value of the Mongolian Tugrik, as seen at the end of 2008 in Figure 1. On the other hand, the US dollar grew significantly at the end of 2008. However, after a sharp devaluation, the Tugrik started increasing again, to a maximum in 2011. This was most likely due to the increase in Foreign Direct Investment, caused by the Oyu Tolgoi Investment Agreement. The OT Investment Agreement started the development of one of the largest mines in the country and one of the largest known deposits of copper and gold in the world. Developing Oyu Tolgoi naturally requires a lot of investment and would boost the country’s economy. Therefore, both Rio Tinto and other foreign investors started buying Mongolian Tugriks to invest in Mongolia. Quantitative easing in the United States and developed economies around the world may also have supported the slow rise in value of the Tugrik. As interest rates dropped to fight the recession, investors would put money into riskier but higher yield investments in countries such as Mongolia. As a result, the Tugrik slowly increased to almost pre-2008 levels. After 2011, the Tugrik started dropping again, quickly falling past the 2008 trough and devaluing even further. The devaluation was caused by dropping coal prices and government animosity towards foreign investment. As a commodity driven economy, Mongolia takes advantage of its immense coal, gold, and other mineral reserves to drive economic growth to as high as 17%. The downside is that when commodity prices crash, the economy follows. In 2011, the coal price reached a peak and started dropping. As a result, mining investments in Mongolia became less valuable, so investors started taking money out of the economy. Just like in 2008, they started selling Tugriks, which caused the currency to drop. Exacerbating this problem was the government’s populist position against foreign investment. In 2012,the government passed the Strategic Entities Foreign Investments Law, which required foreign investments to be approved by the government. This discouraged foreigners from buying Tugriks to invest in Mongolia, keeping the value of the Tugrik low. 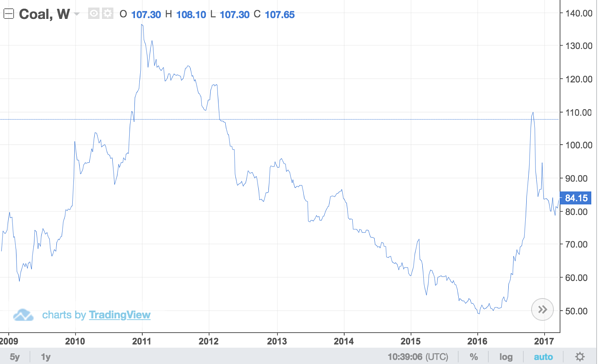 The law was reversed in 2013 (Global Risk Insights), but the fear of political interference again and the low coal prices kept foreign investors from coming back to Mongolia. As a result of the foreign capital flight and dropping commodities prices, GDP growth dropped to 2.4% in 2015 and 1.2% in 2016. Except for 2009, the last time growth had been so low was in 2000. During 2016, as the Tugrik fell even faster, bad news about Mongolia was coming out all the time. Record low GDP growth rates in 2015 and again in Q1 of 2016 (World Economic Outlook); Moody’s and Fitch degraded Mongolia’s rating to Caa1 and B- respectively (CountryEconomy.com); and debt had ballooned to 78% of GDP (CNN). However, things are starting to look up. GDP growth rates have risen to 6.1% YoY in Q1 2018 (TradingEconomics), and both Moody’s and Fitch have upgraded Mongolia’s rating back to a B. To combat debt, the government has met IMF’s conditions for a loan by increasing tax revenue, lowering expenses, and regulating the financial services sector to increase stability. The results are visible. 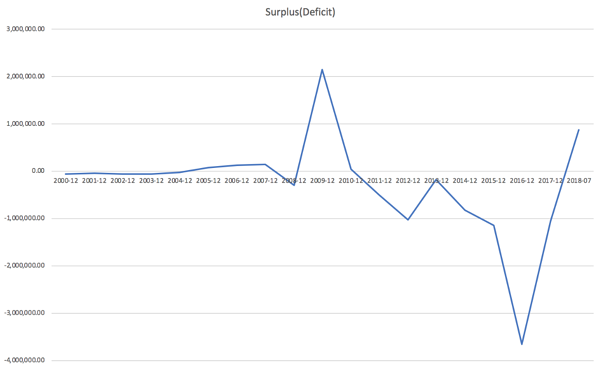 Since 2016, the national government has reduced its deficit and is now operating at a surplus. 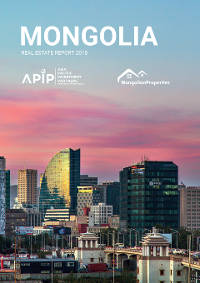 As a result of the government’s change in attitude towards foreign investors, the IMF loan, and the recovering growth of the economy, foreign investors are coming back to Mongolia. As a result, the Tugrik has stabilized a little. Since the end of 2016, the Tugrik has hovered between high 2400s MNTUSD and low 2300s MNTUSD. To put this in context, in the beginning of 2015, the MNTUSD exchange rate was in the 1800s. The stabilizing Tugrik allows investors to safely invest in Mongolia with less worry about currency devaluation wiping out returns on investment.